The ability to make payments from the wrist, specifically from smartwatches is now a reality. Gasping for a water? Need to grab a new t-shirt? The tech is here and small enough to fit inside a watch or watch strap, so lets make it happen. That is exactly what Swedish watch brand Kronaby is making a reality with its collection of connected timepieces for men and women that now tap into Barclays' wearable payments technology solution and its next generation flexible chip that is placed inside a very stylish and normal-looking watch strap to unlock contactless payments. Powered by bPay by Barclaycard, the contactless payment strap will enable users to make safe and secure payments of up to £30 at more than 490,000 locations across the UK. How does Kronaby's contactless watch strap work? Kronaby can make paying for things more effortless using technology that has been available for some time now to make it a possibility. Unlocking those contactless payments skills is a built-in NFC chip that lies inside of its new strap that you won't be able to feel when it's on your wrist or when you need to make a payment. It's the same tech that is enabling a whole host of other watchmakers to smarten up their watches, and Kronaby now wants a piece of the action. It's also the same tech that's found inside of credit or debit cards that can offer contactless payments. The difference here crucially, is that it's built into something you won't have to reach in your pocket for. The strap works with any UK Visa or Mastercard debit or credit card and once you're all set up, all you need to do is look out for the contactless payment symbol and raise the strap to the terminal to make a payment. That means a whole lot of shops and travelling on the London Underground will be places to put it to good use. There's no tapping in codes or waiting for screens to load. Kronaby wants to keep things simple, effortless and like its onboard watch smarts, discreet. While Kronaby has launched its new payment straps to tie in with the latest additions to its collection of hybrid smartwatches, the good news is that they will work with Kronaby watches that are already available. They're available in 18, 20, and 22mm strap sizes, which means if you already own a Kronaby watch with interchangeable straps, you are in luck. By adding payment support that requires you to do very little, it feeds into not only Kronaby's philosophy to stay connected without being distracted, but that general feeling that hybrid smartwatches can equal less screen time and that is definitely a good thing. Of course when we are talking hybrid smartwatches, we are talking the marrying of traditional watch design with connected features that are not necessarily on show that can come alive when paired to your smartphone. When you probably spend most of your day staring at a screen from when you first wake up, that painful commute to sitting in front of one for hours at work, it's definitely good to break away every now and then. It's one of the reasons why smartwatches, particularly hybrid smartwatches like Kronaby's get a whole lot of love. It's something that Kronaby's product manager Jonas Morän is keen to emphasis with the new bPay partnership by, "reducing the need to interact with your smartphone to when it's really needed," Moran explains. "We want to make complex technology work effortlessly not requiring too much attention, breaking a person's focus. 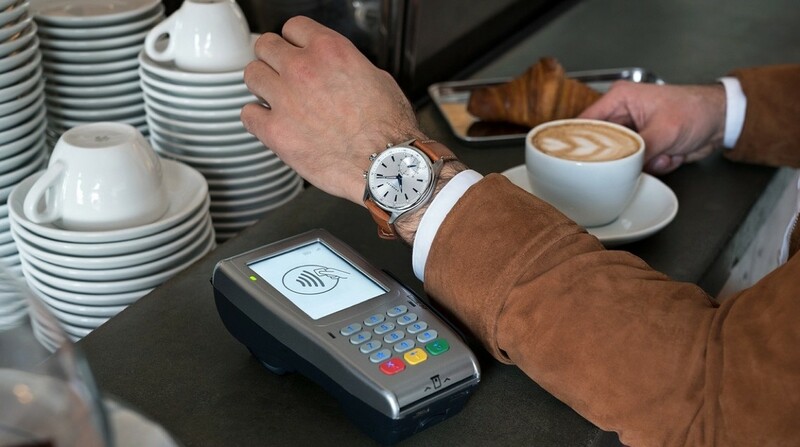 Robert Morgan, head of sales for Barclays mobile payments believes the appetite for wearable payments is at a critical mass and that its flexible bPay chip holds the key that the tech can, 'transform any traditional timepiece into a smart device – without sacrificing style." Making that payment support and tech invisible is something we can definitely get on board with and it's proof once again that you can make smartwatches that look good and pack them with tech without it feeling like you are walking around with a piece of tech on your wrist. It has to look and feel like a watch first and foremost. Kronaby like other hybrid watchmakers have shown you can incorporate useful smarts into traditional watch features in a truly elegant way. Like using sub dials inside the watch face to indicate fitness tracking progress or using the crown to control features to control your music from your phone when you don't have the room on a packed train to pull your phone out. Filtering out the most important notifications from your phone is what Kronaby is all about. Adding smarts that make sense, that take yourself away from your phone screen and will actually be useful on a day-to-day basis. More smart features do lie inside the Kronaby companion app with the ability to assign them to the pushers (buttons above and below the crown). Ultimately though, it's your call if you want to be able take a photo remotely on your smartphone camera or use its Walk Me Home feature that lets you send your location to a loved one to make sure you get home. And the partnership with bPay, Barclays' wearable payments technology solution is just the start. Kronaby is already readying hybrid watches with contactless payment technology built into the watch. But until then, these collection of stylish leather straps that you'd never know were connected, offer an elegant way to spend money without putting your hand in your pocket to pick out a card, a note or some loose change.